Also available online as PDF. ↑ Assembly language. IBM Knowledge Center. ↑ High Level Assembler - Opcodes overview. ↑ Macro instructions. IBM Knowledge Center. ↑ James Saxon; William Plette (1962). Programming the IBM 1401. Prentice-Hall. LCCN 62-20615 – via HathiTrust. ↑ 6.0 6.1 6.2 6.3 Kahanwal, D. (2013). Abstraction level taxonomy of programming language frameworks. arXiv preprint arXiv:1311.3293. ↑ 7.0 7.1 "Assembly: Review - The Ohio State University" (PDF). 2016. ↑ Intel Architecture Software Developer's Manual, Volume 2: Instruction Set Reference. Intel Corporation. 1999. ↑ 11.0 11.1 Intel Architecture Software Developer's Manual, Volume 2: Instruction Set Reference. Intel Corporation. 1999. pp. 442 and 35. ↑ Evans, David (2006). "x86 Assembly Guide". University of Virginia. ↑ 13.0 13.1 David Salomon (1993). Assemblers and Loaders. ↑ B. Schwarz, S. Debray, and G. Andrews, "Disassembly of Executable Code Revisited", Proc. of 9th Working Conference on Reverse Engineering (WCRE), pp. 45–54, 2002. 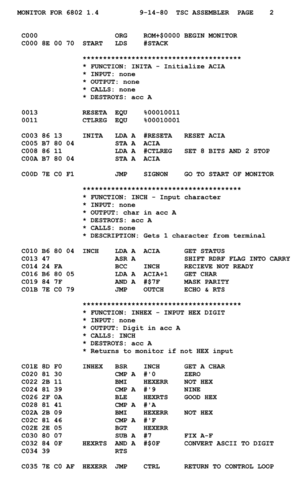 ↑ Z80 Op Codes for ZINT. Z80.de. ↑ Extended instruction mnemonics. IBM Knowledge Center. ↑ "The SPARC Architecture Manual, Version 8" (PDF). SPARC, International. 1992. ↑ IEEE 694-1985 - IEEE Standard for Microprocessor Assembly Language. IEEE Standards Association. ↑ Microsoft Corporation. "MASM: Directives & Pseudo-Opcodes" (PDF). ↑ Chapter 8 - Pseudo Op-Codes. ↑ Difference between assembly language and high level language. IT Release. ↑ Decision-Making in Assembly Language. UMBC. ↑ Randall Hyde. "The Great Debate". ↑ "Writing the Fastest Code, by Hand, for Fun: A Human Computer Keeps Speeding Up Chips". New York Times, John Markoff. ↑ "GCC makes a mess". HardwareBug.org. ↑ Click, Cliff. "A Crash Course in Modern Hardware". ↑ Hyde, Randall (1996-09-30). "Foreword ("Why would anyone learn this stuff? "), op. cit. ".